I've been using just PC skincare for a couple of years now, and it's made so much difference to my skin. I have combo skin - and this gel BHA is amazing! It feels a bit sticky once you apply it, but it vanishes as soon as I put my serum/moisturiser on top. I think it's amazing value for money as well, because one bottle lasts for AGES. It has made a really big difference on my skin, unlike anything I’ve tried before. My skin doesn’t look as dull and tried anymore. Anne-Katrine - Love this product! Reduces fine lines and soothes the skin. I use the gel everyday and I love it! Have ordered it many times now and will definitely recommend it! I was previously using a liquid version exfoliant and wanted to switch because I felt that A) it was drying my skin out and B) it was slipping off my face without working as effectively. However, if I use more than 2 drops of this stuff my face becomes stickier than fly paper. Even using a tiny amount, it still dries in a shiny layer that feels a bit greasy. It's ok if I use it before bed and it is working, but it's really hard to manage dispensing the correct amount. I have hormonal acne, it's cystic and no, this product alone does not solve all my problems, but for a single product this is amazing (if your skin likes BHA) if your chin breaks out in the meanest and most painful zits ever. I don't find this drying but I do find it difficult to layer with other things because it's quite sticky. I tend to reserve the use of this for when I have real breakouts and then i put a decent amount on and leave it overnight. I don't think it'd be good for during the day because of the formula, but for overnight I really think this works better than the liquid. The one plus i've found with this is that it lasts forever, I have had my bottle since 2014 and it's still going - the smallest amount goes a really long way so it's definitely a worthwhile investment for breakouts, although for daily use the liquid would be better. Basically, i use this as a treatment/overnight mask type of thing and yes... this is the absolute bomb. Just keep applying on the affected areas overnight until they calm down. Wonderful stuff. I ordered a few samples of all of PC BHAs to try them out after disappointing results with the Calm 1% BHA lotion. This gel was the first on my list to test out. I started using the gel on a small area of my face, the same area that I had tested the Calm 1% BHA lotion. With the Calm BHA, I had an initial breakout of angry red pimples that quickly turned into whiteheads and left many scars. It also did nothing for my blackheads in the long run, and did not reduce redness or minimize pores. Perhaps because I had previously used the Calm BHA, the initial breakout wasn't so bad with the 2% gel. I got one cyst which could have been hormonal and therefore inevitable anyway, and a couple of small whiteheads. An old cyst that was no longer inflamed also surfaced, perhaps as a result of the exfoliation. However, I have now been using the gel for 2 weeks and have seen NO IMPROVEMENT. Blackheads and sebaceous filaments are still forming, pores still appear large and noticeable, my skin tone is still red, uneven and I have a lot of new and old scars which aren't showing any signs of improvement. I will give it another couple of weeks, by which time I will have used all of my samples but I'm not holding out any hope of this gel actually doing what it says it will. The only positives have been that I haven't noticed any irritation as I did with PC Clear regular strength anti-redness exfoliating solution (2% BHA liquid). That made my skin so red and tight and when I washed my face with a gentle cleanser, it was burning! The gel is not like that at all. It hasn't dried my skin out any more than usual and I have only noticed a slight stinging very occasionally straight after I applied it. It also seems to absorb well and doesn't just sit on the surface and peel off as some gels can. Thank you Paula's choice. I will never be without this product. It has transformed my skin, no more hormonal breakouts, smoother texture and discolouration's slowly fading. Nothing works overnight so if you are buying this for that it will disappoint you, however if you are looking for consistent gradual improvement this is what you need. My skin produces less oil, is balanced and overall calmer. I love this product. It works brilliantly on my combination/break-out prone skin, clearing up breakouts with no dryness or irritation. Yes, it is a bit on the sticky side, but I only tend to use it at night time. For me, this is the single most brilliant skincare product ever!! It took about a week of twice daily use and all the small bumps on my chin were gone and my skin looked completely clear. This product is great for preventing spots, and if I do get them, dab some on and they reduce over night. My skin is much less shiny as well and the makeup lasts longer without needing to be touched up. I am 40 years old and I had a nodular acne breakout on my chin. I used benzoyl peroxide 5% together with this gel and my skin is clear. Now I use the gel only and I have not had new spots. BHA is great for spot prevention and I made it a part of my everyday's skin routine. I like the gel as it easy to apply but I also like the liquid and the lotion for my combination skin. I find the lotion to be mildest towards the skin as it seems to be shooting as well. The lotion is not greasy at all and it takes not time to dry. The gel and the liquid take some time to dry, approximately the same time. I find it useful to purchase different forms of BHA and use them according to the time of day and use or no of make up. I don't like gel under the make up but the liquid and the lotion are excellent for use under the make up. Thank you Paula for this great products. Ali Liz - Didn't do anything for me! After much research I chose the gel formula to help tackle some stubborn blackheads. I have been using it daily for two months now with no positive results! Blackheads still there and look as stubborn as ever. After the first use my skin didn't look different but felt very soft and smooth. After two weeks of use the discoloration almost disappeared, the spots have almost gone and blackheads are shrinking. My face feels smooth, soft, even and any even cheap face cream goes over like a dream. It's a pleasure to look at myself in the mirror every morning. I advise buying a gel because of the light texture on a combination skin and no need for a face cream. I tried this product after already trying the BHA "liquid" which is basically a toner, and I didn't notice results and also didn't like the idea of wasting so much expensive product on cotton pads to apply it. I tried this gel instead, and whilst it is much more effective, it's very uncomfortable to use. I try to wash my face and put it on at night so it doesn't get diluted/wiped away with other products in the daytime, but it's so unpleasantly sticky and gooey I don't even want to kiss my husband good night. Even after letting it sit for 20 minutes, It all just ends up getting wiped off on the pillowcase. I wish it had the texture of the Resist AHA 5% product which is a lovely smooth cream that absorbs easily and I use during the day. This BHA gel is just too sticky! Customer Care: Thank you for your review. We are sorry to hear that you don't like this texture. Please make sure you don't use too much, as a few drops should be enough for your whole face. You could consider to try out the Skin Perfecting 2% Lotion Exfoliant, that has a creamy texture. After reading all the positive reviews I decides to purchase it. I really wanted to like this product and I was really looking forward to using it. After the first use it broke me out badly. I was really disappointed. After the second use I had the worst breakout ever. My face had so many painful spots. Even now a week later it feels painful and pretty sore. Customer Care: We are sorry to hear of your experience and discomfort. While it's possible your skin may not be able to tolerate salicylic acid, what's much more likely is that the exfoliation this BHA product provides loosened clogs deeper in the pore lining, causing them to surface all at once, thus resulting in more breakouts. For many who experience this, it's a temporary issue that resolves with ongoing use of a BHA exfoliant. We understand your hesitation to go back to using this product, but suspect if you stick with it you really will see clearer skin! If you remain unhappy, please contact us to discuss a refund. I bought this BHA for my closed comedones, was applying it correctly and everything, but unfortunately for me it didn't work at all, even more so, it gave me horrible cystic acne. I stopped using it, switched to AHA and things are slowly getting better, but it sure was very unexpected and disappointing. Rather than manual exfoliation, I decided to use this product. Bad decision on my part. From the start and into a couple of weeks, my face was covered in lots of tiny spots (apparently this product is not meant to purge the skin). I decided to use it on my chest to see if this gel was the problem and not my other products, and yes, I woke up to my chest being covered in an astounding amount of red blemishes. I'm really surprised at the positive reviews, but I guess everyone has different skin. Jenny - Best money I've ever spent. I had heard a lot about BHAs and AHAs and finally decided to take the plunge. I have very oily skin with blackheads and occasional breakouts PLUS sun damage (I grew up in Florida), so I chose the BHA 2% gel. I noticed a difference after just two days! My skin was smoother and almost glowing, while my breakouts went away and my pores shrank. This gel does go on a little sticky, but you don't need a lot and it absorbs in 10-15 minutes, plus you can put powder over it once it's fully absorbed. I use this twice a day and it's safe to say I will be buying this for many years to come. Please don't ever discontinue this product! I'm a teen with spot prone skin and lots of blackheads and clogged pores on my nose and chin. I ordered this product with high hopes and at first, thought it was working (persistent blackheads appeared slightly reduced). However, after about a week my skin no longer felt soft after use and my blackheads have remained exactly the same. I'm so disappointed as all the reviews seemed so positive, I just want to feel more confident in my skin and I thought this would help! Customer care : Thank you for sharing your findings with us.With lots of blackheads and clogged pores we recommend to try our Skin Perfecting 2% BHA Liquid or the products out of our CLEAR line. Use a gentle, water-soluble cleanser and a gentle washcloth to add a bit of manual exfoliation, but don't overdo it. No irritating or drying cleansers should ever touch your face. This exfoliant has done wonders for my skin, I cannot recommend it highly enough. You only need a small amount (I use 1 and a quarter pumps for whole face minus the eyes) and is very easy to apply. It's exfoliated my skin nicely after once daily application over a few weeks and has slighltly reduced the number of spots I'm getting. My only gripe with this product is I find it very shiny when on, even if I leave it to sink in a while, however this is only a minor thing as I only apply it at night so I'm not too bothered what the products make my face feel like, as long as they are doing it good which this is. I can't believe how amazing this product is, and that I haven't had it in my life sooner! I have suffered with blemished skin (including cystic acne) since I was 13 and I'm now 32. After having a baby my skin awful, breakouts everywhere, congested skin and cystic acne on my jawline. My face was so sore I would cry, and was so embarrassed when I went out. I had to wear foundation, concealer and powder and my skin looked awful still. Over the years I have tried literally everything (including prescription antibiotics and lotions) - but NOTHING has ever worked amazingly as this. I applied it morning and night on cleansed skin and within 10 days I was leaving the house without any make up on at all. My skin is not only free of blemishes, no cystic acne to be seen, blackheads are virtually non existent, my pores are tiny and my skin so smooth. It was drying for the first few days but now I could get away without moisturiser afterwards if I needed to. I thought I would wait a good period of time before reviewing, and I have been using this intermittently for six months. I wanted a BHA exfoliant for my blackhead and blemish prone combination skin, with rosacea. Initially I was happy with this product - my skin felt smooth, blemishes cleared and blackheads reduced. The problem is that this dried even the oiliest parts of my skin out like crazy! I switched to once daily usage, then down to once every few days, and still I got horrid flaky dry patches. I now use this maybe for a couple of days every 1-2 weeks, which sadly doesn't help my blackheads much. I have no doubt that these bha products work well, I just feel sad that I can't seem to use this one. I wish I had bought the 1% bha lotion as I think it would suit my skin better - so just be mindful if you have combo skin, that this can be very drying. Unfortunately it's quite expensive so I will just have to stick with this for now. On the plus side after six months of intermittent use my bottle is still 75% full. I've been using this for about 3 weeks now, and have been really impressed with the improvement in my skin tone - it's softer, smoother, and blackheads are appearing reduced. I have very oily, acne-prone skin, and as such have learned not to expect miracles from products, but having tried most things and got into a bit of an expensive rut using dermalogica for the last couple of years, I fancied a change, and I'm glad I did! I agree with other users in that this can leave skin looking a bit shiny and feeling quite tacky at first, but I've found that using a little less product, rubbing it in properly and following with agood moisturiser all help. I use it twice a day and would't want to be without it now - can't wait to see the results over time! I cannot express my delight at finally finding a product that takes care of my holy trinity of skin ailments (acne, ageing and eczema). I'm 37 so I want anti ageing but this caused break outs, when I used products to treat the breakouts this flared up my eczema, when I used a steroid cream for the eczema, this caused fine lines. This product is astonishing. Not only has it ELIMINATED my hormonal acne, my skin is radiant and my fine lines are gone. AND the biggest bonus, it doesn't flare up my ridiculously reactive skin. I only use it at night (I think twice a day might be pushing it with my sensitive skin) but I cannot praise this product enough. 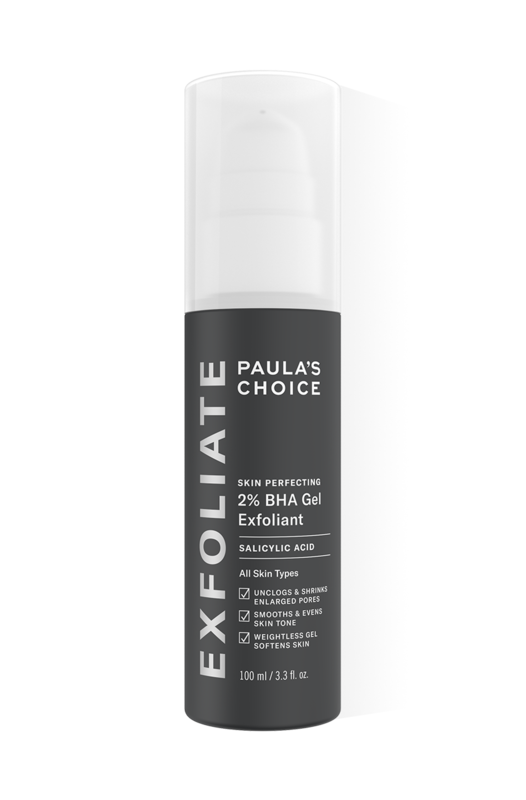 Paula's Choice has literally saved my skin! Louise - So happy with this! I have really sensitive, really oily skin with dry cheeks. I get really sore spots on chin, cheeks, neck and even my chest that last 3 weeks at a time, and lots (and lots) of blackheads/clogged pores. Was just about to give up and go back to doctors for antibiotics when I tried this. I am so happy, within days my skin looked better! After a month it is completely different. I can wear no make up and feel lovely. My boyfriend keeps saying my skin is 'glowing' and my friends and family are noticing the difference. Even my brother is going to try this! I would say that you should just try it, you never know. My skin reacts to all sorts of things but luckily has been fine with this,I use it once or twice a day. Thank you so much for the good advice on this website. i wouldnt dream of going to sleep without this product on my face! i cant believe how much of a difference it has made to my skin. It goes on a little sticky but sinks in pretty quickly and hydrates my skin really well. i dont need to follow up with a moisturiser if i dont want to. i tried the 1% version with no success but this one has reduced my blemises by 90% and has improved the clarity and tone of my skin massively. also impressed with the amount of product you get and the controlled pump-- i never get too much! i use this daily with no irritation or sensitivity! Love the products from this range normally - and they've done wonders for my skin - so I have no doubts that this is an excellent exfoliant. For me personally however this product made me breakout severely; having read about BHAs beforehand I understood that a purging process wasn't unremarkable, but after 2 weeks daily use my skin had gone from having merely a few small pimples to my left cheek being completely covered in large whiteheads (not to mention areas of my face that had previously always been clear breaking out for the first time). I would have been willing to let the initial purge subside and continue usage of the product, but the spots were leaving behing pretty awful scarring. Will stick to the 8% AHA from now on (which is a fantastic and irritation-free solution for me). Customer Care: We are sorry to hear about your experience. We will contact you by email. This is a GREAT product.. makes your skin feel amazing... I have very stubborn blackheads and dry areas that feel uneven and horrible.. after using this product and it drys your skin feels like silk.. beware not to apply to often though!! - Resist the urge to apply more and more regularly, and respect the strength of this product. I have found I was over-using it to a degree which was actually causing more irritation and blemishes. I have since settled on applying every other day. - Use of daily sunscreen is essential with this product. The mechanism by which it perfects your skin is eradicating the unsightly natural barrier of dead cells. Megan - An Amazing Product! I have been suffering from very bad cystic acne in the T-zone area and around my mouth for over two years. This product has literally saved my skin! I'm very glad I found Paula's Choice. After three weeks of using this product, my skin has cleared up, I don't get cystic acne anymore but only the occasional white spots. But this is a HUGE improvement for my skin! I still have acne scars but they fading away slowly and can be easily cover up with concealer. I used this product every night during the first week and found this to be too drying for my skin. My current routine is to use it every other day at night after cleansing only. I found this to be much gentler and still do the job. I would highly recommend this product to anyone who is suffering from acne. The only advice I can give is to use it accordingly to your own skin' needs, then watch the transformation! this made me break out in horrible non inflamed lumps sore! i stuck with it for about 6 weeks but skin never got any better i had to stop and soon my skin got calmed down im really dissapointed as i have tried the liquid before and it was ok nothing special but i did not like the application of it and use the aha and it is a gel and really like it so thought id try the gel but it was not good im now left with half empty bottle gutted id say try liquid if considering it seems to be the best for most people. Customer Care: We thank you for your feedback. You can always contact our Customer Service for assistance with finding a product that will work for you. Really impressed with this product. It's made a visible difference to the texture of my skin, which looks finer and smoother. The gel is easy to apply, and a little goes a very long way. I only use it at night, with a serum on top, but as it leaves a slight film I would pick the liquid version if I wanted to apply it in the morning as well.